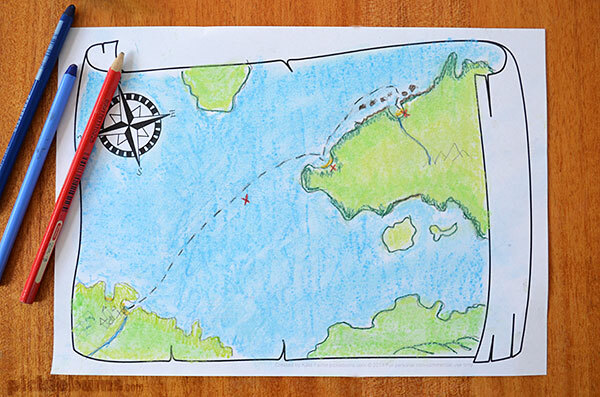 Map Drawing Prompt: Free Printable. Recently a fellow blogger and author, Allison Tait, sent me a copy of her new book – The Mapmaker Chronicles, Race to the End of The World. My kids couldn’t agree on who should get to read it first, so I settled the argument by reading it aloud to them all, one chapter a night. Oh it is a good book! It has great characters, mythical beasts, and a fabulous young hero. It’s set in an world that grows effortlessly in your imagination, and with lots of action and adventure, it’s perfect for 8-12 year olds, and anyone who enjoys a really good story. “The series is set in a time when so much is unknown. Is the world round? Is it flat? Is there a fire-breathing dragon waiting just beyond the horizon? Of course, the only way to find the answers to those questions is to go – even if you have to be dragged kicking and screaming onto the endless ocean, like our hero Quinn. And sometimes, just like Quinn, you find way more than you ever bargained for. We are almost at the end of the first book and all of us are torn between being desperate to know what happens next, and not wanting it to end, even me! We are already counting the days until the next book in the trilogy is released! To stretch out the fun of this great story my kids have been playing lots of ‘Mapmaker’ imaginative games and we’ve had lots of fun creating our own maps. I created a simple map drawing prompt to get the ideas flowing, and got out our chalk pastels so we could have fun smudging and shading colour on our maps. You can download the free map drawing prompt here, or click on the image above. This is an A4 pdf file, make sure you choose ‘landscape’ from your printing options and if you are printing on US letter sized paper make sure you also choose ‘fit’ or ‘shrink to fit’ from your printing options. It was interesting to see my kids drawing the things from the book as they imagined them. My big boy imagined the ‘sea monster’ very differently to the way the girls and I did! The first book in the Mapmaker Chronicles – Race to the End of the World is available now at Booktopia, Amazon (on kindle), and other great book shops. Our local bookshop also has it so you shouldn’t have trouble getting your hands on a copy of this great book! The next two books in the trilogy will be released next year, and we can’t wait! Find out more information here. 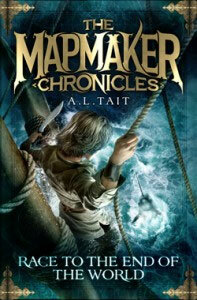 I have a copy of The Mapmaker Chronicles – Race to the End of the Earth to give away to one of my Australian readers! This competition is now closed. Congratulations to our winner – Karla. Simply leave a comment on this post and tell me what your favourite adventure story for kids aged 8-12 is and why. The answer that makes us want to run out and read the book will win! Entries are open to Australian residents only and close midday October 31 2014. See the end of this post for full terms and conditions. Open-ended Play and Learning With Maps – from me! We’re Going on A Bear Hunt Map and Binoculars from Bug and Buddy. Finding My Family on a Map from Powerful Mothering. Me on the Map Activities from Montessori Now. Map Science with a Homemade Compass from What We Do All Day. 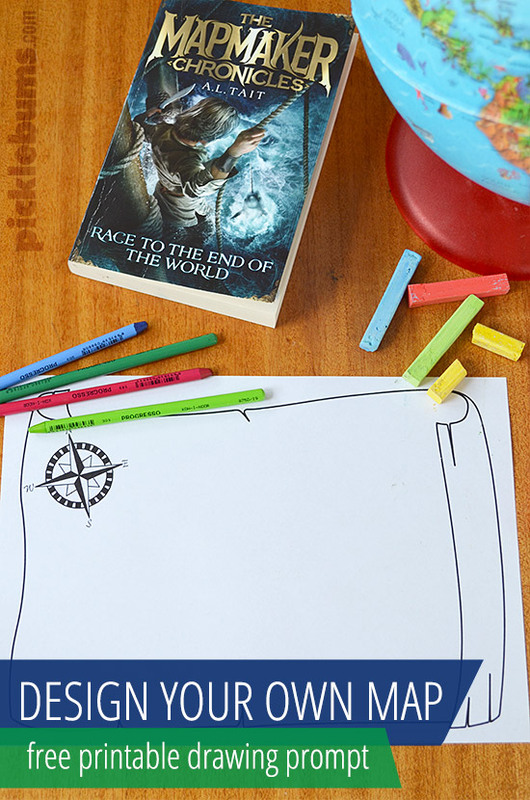 Geo-literacy World Map Activities For Kids from Nurture Store. Seven Continents for Kids from Creekside Learning. 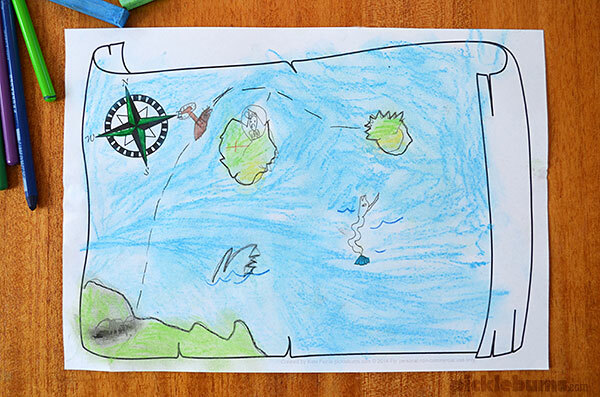 Make a Pirate Treasure Map of your Yard from Teach Beside Me. One winner will each receive a copy of the The Mapmaker Chronicles – Race to the end of the Earth – prizes may differ to the ones shown here. Winners will be contacted by email and announced on this post by Monday Nov 3 2014. The winner agrees to have their contact details passed on to the appropriate PR company or brand representative who will send out/organise the prizes directly. I love the “Song of the Lioness” series by Tamora Pierce (the first one is called “Alanna: the First Adventure”). It’s medieval fantasy with a fiesty girl protaganist – Alanna, who swaps places with her twin brother because he doesn’t want to be a knight and she does. I read the first one aged 11 in the late ’80s at which point there were few adventure/fantasy novels with female leads. Alanna is smart, brave and independent and the books are well written but also plot driven. The books are a nice variant on the typical fantasy “group of heroes on horses go in quest of magical object” genre. Since the Alanna books, Tamora Pierce has written numerous other series (all suitable for probably 10/11yo +) and she’s one of the few authors whose new book I will run out and buy the day it is released! Amazing, Kate! I just love this! 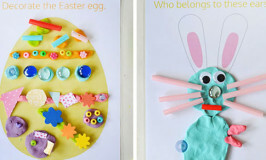 :D So creative and inspiring! Thanks for sharing ? What a great list of posts there just bursting with useful resources surrounding this topic. Happy Weekend to u all! We love Rowan of Rin by Emily Rodda. It has all the elements of a fantastic adventure book: a noble but unexpected hero, an exciting quest for survival and of course mythical creatures and fire-breathing dragons. What sets Rowan of Rin apart is that nothing is evil and no one is betrayed or killed, yet the story is still tantalising to parents and kids alike, even those normally scared off by this type of book like my timid 9 year old daughter. Riddles to solve throughout the story add to its appeal and keep young minds thinking, and the fact that it is by an Australian author makes it a hands down winner! The books my kids and I loved were the Keys to the Kingdom by Garth Nix. We listened to the audiobooks read by Alan Corduner. AMAZING!!! A young boy is inadvertently given a Key to the kingdom – a parallel world in a parallel universe that is based on a grand old house. Arthur Penhaligon is sucked into the world of the house and dangerous forces are trying to reclaim the key. To return to his own world and save his family he must collect each of the seven keys one or each day of the week and become master of the house. This series was complicated, detailed and descriptive. Each of the seven books takes place on a different day and in a different part of the House – the Border sea, the Mines, the Upper reaches. I recommend listening to the audiobooks – Alan Cordoned is an amazing reader. My kids and I listened every chance we could. Many a time my husband found us sitting in the car in the dark trying to finish a chapter. I bought, “Whale Rider,” by Witi Ihimaera whilst travelling through New Zealand and its focus on the gender and cultural issues within the Maori people and how a young female overcame obstacles and inequality to become a Whale Rider. OMG! Tricks would love this – he wants to be like his dad so much. Maps run in their blood – MG’s great grandfather and great great grandfather were both surveyors. The Rangers Apprentice series by John Flanagan. Action, adventure, horses, archery, battles, Skandians, a mysterious heritage, castles, kingdoms and ruthless enemies. I could not put these books down, and I read them before my kids did. These books are truly wonderful, and easily read over and over. 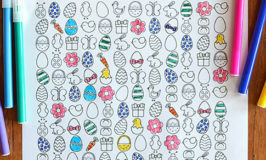 We have just completed “The Word Hunters” trilogy by Nick Earls. An adventure involving the history of words, time travel, historical events and figures and a local Brisbane set of twins searching for their grandfather. We didn’t know anything about words before this and now I can tell you how we started using “Hello”! A great, read together book for all. 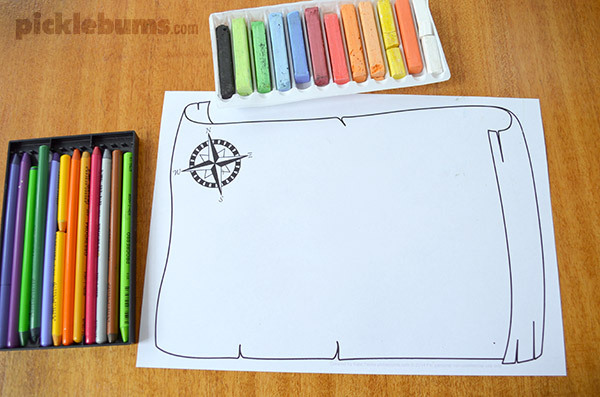 Home » Map Drawing Prompt: Free Printable.